The first stagecoach in Essex County, drawn by four horses, was established in 1774 and connected Newburyport with Boston via Salem and Ipswich. By the early 1800’s, up to seventeen stagecoaches and four post chaises passed through town each day, most of them full to overflowing. In 1803, the Newburyport Turnpike Corporation built a straight toll road from Boston to Newburyport, which we now call Rt. 1, but the new road went “Over every hill, missing every town” and coaches continued to use the Old Bay Road. Two riders approach the South Green on today’s County Rd., while a stagecoach in the distance approaches from the other side. The South Congregational Church at the far end of the Green no longer stands, but most of the houses remain. From an 1840 painting, artist unknown. “Coaching in New England,” water color by Alfred Fitch Bellows. “The stage coach was in its day as great an advance upon the prevailing modes of transit as the railroad car was in later time. It thoroughly revolutionized all extended travel and gave an aspect never before observed to all the world of outdoor civilization. It was gazed at by boys on the highways and women at the windows. Its approach announced by the jingling of a bell suspended from the neck of one of the leaders was the occasion for the shout of “THE STAGE THE STAGE” and a general halting from labor and a gazing at the wonder. 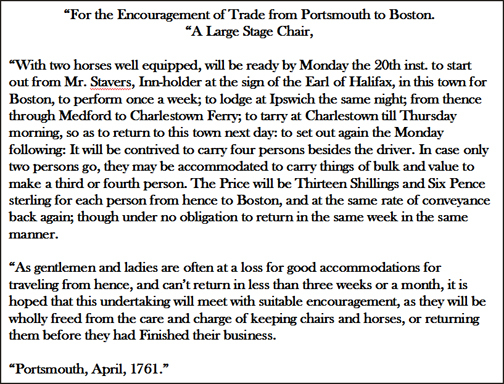 This advertisement for the stage coach from Portsmouth to Boston listed a stopover in Ipswich. 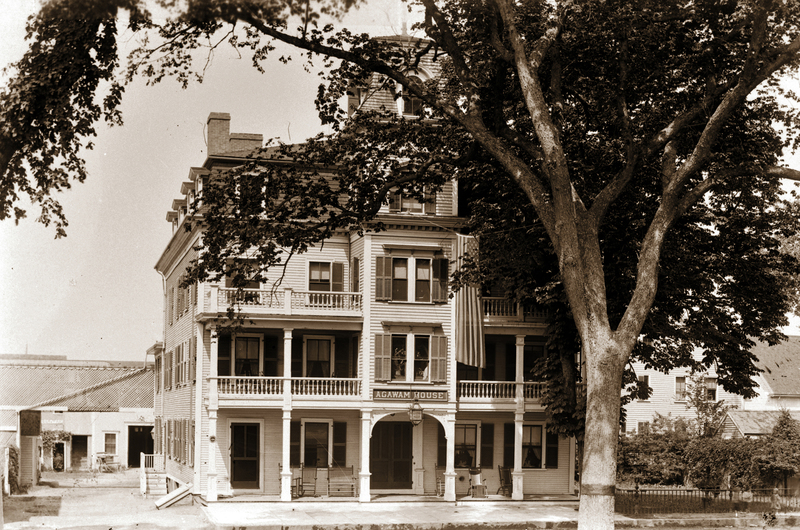 The Agawam House on North Main Street, originally the second Treadwell’s Inn, had stables in the rear to accomodate the stagecoach and its horses. The building still stands, but is unrecognizable. 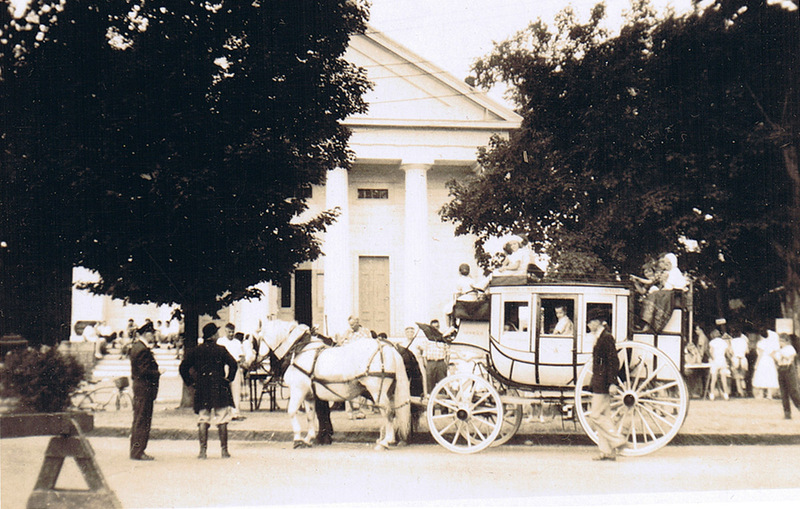 Appleton family stagecoach in front of the Second Congregational Church at the South Green, during Olde Ipswich Days. Stagecoaches quit passing through Ipswich when on December 20, 1839, a train from Boston made its first passage through the town. It arrived about 9 o’clock on a Friday morning with 50 passengers, taking only 34 minutes from Salem. Townspeople were delighted, but the opening of the railroad and the end of stagecoach travel led to the decline of Ipswich as one of the most important towns of Massachusetts, and removal of its courts. Thank you for this article. Your writing always offers a unique insight. Stunning photos!